Author's Note: There are some spoilers revealed in this review of THE EMPTY THRONE. Please do not read if you are concerned about having plot points discussed. The first book in the Boulevard series. It was inevitable that the popular television show, Xena: Warrior Princess , would inspire a series of novels under the same name. To be sure, there are hundreds of entertaining fan-written Xena stories on the internet, but they all come with disclaimers. The four Xena novels thus published by Boulevard Press are the only Official Authorized Xena novels. Fans can read about their heroes, Xena and Gabrielle, in new adventures that are similar to their TV exploits. The novels are also much longer than the hour episodes (actually 45 minutes after subtracting commercials, intro, and trailers) and can therefore expand the story in ways the TV program may not. The Empty Throne (Boulevard, 1996) is the first of three Xena novels written by Ru Emerson. The story spans 231 pages. The novel was first published in October 1996. It had to have been written during the early drafts of the first season's episodes or shortly thereafter. The Empty Throne is essentially two separate stories tied together by Xena and Gabrielle's mission to the island of Ithaca. The time line is concurrent with events told in Homer's classic, The Odyssey . King Odysseus has gone off to fight the Trojan War for ten years, then wander another ten before returning to his island, and his wife, besieged by suitors. Other Odyssean elements surface in this story such as a reference to Homer as a boy, the goddess Calypso, and the sorceress Circe, who in the novel, torments a small town. The events transpire before Homer has written his famous poem, and the King has simply disappeared after fighting the Trojan War, and no one knows his whereabouts. 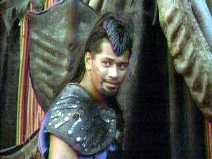 Xena must visit his wife, Queen Penelope, in the hopes of gathering information for the King of Sparta. On their way to the island, our heroes come upon a town that has had strange things happening to its men of late. There is also a subplot about a small time pillager named Kalamos and his band that must be dealt with. Xena comes up with a plan to rescue the menfolk of the town, but it is Gabrielle who talks her way into a satisfying resolution of the dilemma. Xena and Gabrielle solve the town's problems and set off by boat to Ithaca. in COMEDY OF EROS (#46). The second part of the story concerns the royal family remaining on Ithaca, being held captive by Xena's old nemesis, Draco. The Warlord Draco is living high off the hog with his army of 200 drunken men, and sees himself in the not-too-distant future as the King of Ithaca, with Penelope as his wife. Xena must figure out a way to rid the island of this riff-raff. As you can probably guess, she does, and the royals live, for the time being, happily ever after. The story is well written, and the pace of the first half is acceptable, but the second half is positively glacial. This is hard to adjust to compared to the briskly edited television show. I kept waiting for something to happen, some action, but no, tedious conversations and lengthy scene setups fill most of the pages. There are too few battles scattered amongst the forgettable characters and mundane situations. The pace of the second half is leaden, and the situations take much too long to develop into anything interesting. It seems to me that the promise of a Xena novel, with its many hours of storyline, is the detailed rendering of the relationship between Xena and Gabrielle that this extra time would allow. Unfortunately, The Empty Throne does not fulfill this promise, and this certainly hurts the readability of the book. Starting with our dark haired hero, she is not much more than an inscrutable "Xena icon" in this story. She is smart, canny and tough, to be sure. She is written as a hero, and performs heroic deeds. She is not portrayed as anything other than cool and efficient. Xena's dark past is seldom mentioned. Emerson does not give us access into Xena's thoughts or feelings, which is a golden opportunity missed. Her relationship with Gabrielle is as a friend, and not even a particularly warm one at that. If I had to compare the quality of Xena's and Gabrielle's relationship in this novel to one of the television episodes, THE GIANT KILLER (#27) comes close, but even this show featured a simple hand holding scene that goes beyond anything in the novel. Gabrielle comes off as somewhat annoying, a long winded, non-stop talker. Her subject matter seems always centered on bard tales, mythology, or politics in the local region. She is just not as droll as her television incarnation. To her credit, she is allowed to solve the town's dilemma, but she goes against Xena's orders to do it. 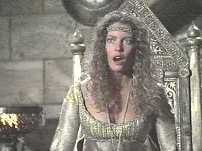 Gabrielle's best scene is with the sorceress, Circe. Gabrielle launches into an improvised girl-to-girl talk about finding Mr. Right in an attempt to turn Circe's thinking around. Gabrielle resorts to unabashed flattery and fawning to win the demigod's trust. Her plan works, so I suppose the means justify the end, but I found this scene somewhat unpalatable. Once on the island, her sole job is to distract the queen from her sorrows with endless stories. Gabrielle does not even get to whack bad guys with her staff. Is this the Gabrielle we know and love? No, she would be in the thick of the fight with Xena, acting like an Amazon Princess. The pillager, Kalamos, actually gets some of the best dialog in the story. Upon his encounter with Xena in the town of Isos, Kalamos woos her with a lengthy sales pitch hoping to convince her to team up with him. This piece of writing is very amusing and it also serves to fill in gaps in the storyline. Xena then dishes up some hard knocks on his crew, making this early chapter the highlight of the book. Odysseus' wife, Queen Penelope, is a whimpering, hand-wringing royal. Her son, Prince Telemachus, is earnest but one dimensional. Draco comes off the best of any supporting character, but he has gone soft in this story and is hopelessly flim-flammed by Xena. Draco's main interest is in developing his appetite for gourmet foods. He eats a lot and never threatens the royals with harm. He respects their autonomy by allowing them private quarters and servants. He seems to take it in stride that Xena suddenly shows up on the island, and once there, Draco allows her to roam around at free will. Not much tension generated by these circumstances. There are other minor characters: Draco's cook Lemnos, who befriends Xena; and Metrikas, a hulking, angry warrior that you just know is going to get it. None of these characters stand out in any way. There is no suspense or no danger in this story because it is apparent that Xena will always prevail, in a super hero fashion. Xena and Gabrielle are never in a perilous situation, they just adjust to problems that come along and solve them. This is perhaps the story's greatest weakness. There is nothing to build suspense, only a mild mystery in its place. The second half of the story is entirely Xena assessing the situation and formulating a plan, until the last few pages, where the plan is revealed and put into action. It is a lot of reading for very little payoff. To her credit, Emerson has captured the show's style of the two women's verbal repartee, and lavishes many small details in scenes throughout the story. For you subtext fans: forget it. There's nothing here for you. For you action fans: it is a long dry spell between fights, and Xena really does not do much. Draco's men essentially fight each other, and they even eliminate the thugs from the village, saving Xena the drudge work. The chakram gets thrown once, near the end, and it is referred to in the novel as the "shakra". I suspect that this novel was written fairly quickly, and without an "insider's" feel for the nuances of the television program. I hesitate to call it a quick knock-off, but one might suspect that. In an article dated 5/29/97 in the San Francisco Chronicle, Ms. Emerson is said not to have been aware of Xena until her agent suggested that she tune into the show. In her book's acknowledgement, she does state that she "watched the Action Pack late nights for many years". To be fair, the television program has developed the Xena and Gabrielle characters quite a bit in the last year, and not surprisingly, the novel suffers in comparison. This is a novel that you might put down and not pick up again for three or four days. I read it over a period of four or five weeks in this manner. It just does not compel compulsive reading. However, its apparent worth would increase to anyone waiting in an airport terminal or bus depot, and it would make a good backpacking companion. It is a nice way to take some Xena with you wherever you go, and after all is said and done, this is probably its greatest virtue. As to an overall rating, I base mine on the internet Xena fan fiction pages, which generally rate five stars as the best. I would give The Empty Throne two and a half stars.